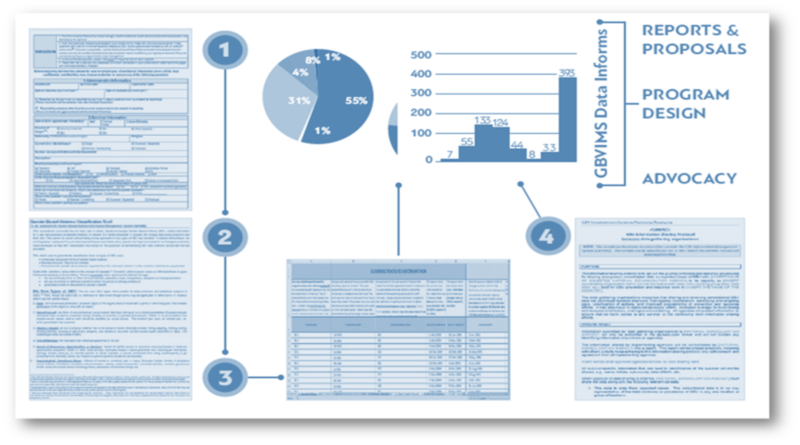 The Gender-Based Violence Information Management System (GBVIMS) is a multi-faceted initiative that enables humanitarian actors responding to incidents of GBV to effectively and safely collect, store, analyze and share data reported by GBV survivors. Read a two-page overview here. GBV Classification Tool– a set of six types of GBV to standardize GBV definitions and the incident classification process. Intake and Consent Forms – two forms used for collecting GBV data. The Intake and Initial Assessment Form is a standard intake form designed to ensure that GBV actors are collecting a common set of data points. The Consent for Release of Information Form requires survivors’ authorization for any of their information to be shared; it is intended to ensure that the rights of the survivors to control their incident data are maintained and protected. Incident Recorder (IR) – an Excel database designed to simplify and improve data collection, compilation and analysis. GBV Information Sharing Protocol Template – a protocol template that outlines guiding principles on the safe and ethical sharing of GBV data and best-practice to follow when developing an inter-agency information sharing protocol.